The Azalea can often be found growing as a small bush or as a shrub. Some choose to carefully prune them into thinner or taller shapes. They may also be pruned to resemble bonsai plants even at full height. This plant can be grown from seeds or by planting healthy cuttings.They are long lived, with many thriving for decades with proper care. There are many festivals and events that feature these flowers. Azaleas are a flowering shrub known for their fragrant bright blooms. The shrubs bloom in spring, with flowers lasting for several weeks. Blossoms are often one per stem instead of in large cluster groups. There are at least 17 native species of azaleas to North America. These offer flower colors ranging from white to red and pale pinks. Yellow is the rarest of the colors, making it a prized garden plant. The Rhododendron canescens is possibly the most common variety. Flowers are often pink, with some producing white or pale pink. Some may be more stark or vivid depending on the cultivation type. Rhododendron atlanticum is a spreading species in the midland coast. Blooms are often white, with some increasing to vivid pink shades. This is often a dwarf variety, making it smaller than many others. These small species are commonly sold by florists for their portability and vivid coloration. They are especially popular in cities like Pomona, CA, Durham, NC, Worcester, MA, Houston, TX, and Dayton, OH; they are sold just as much as any flower bouquet for their beauty, but with added duration. Colors sold here include both the pink and white variations. 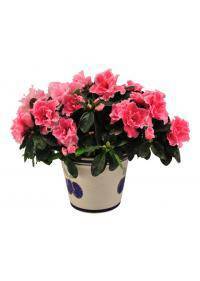 Slightly acidic soil is often preferred by garden azalea plants. Soil pH of 5.5-6 is often recommended for the best blooms possible. Organic materials should be added to enrich soil before planting. Shade or partial sun is preferred, making it a choice for shady spots. Too much direct sun can scorch the flowers, and lead to less growth. Protection from heavy wind should also be considered when planting. This evergreen will display leaves year round in many climates. It can withstand temperatures that reach -10F and still survive. A heavy mulch may be needed to protect the base and keep moist soil. Fertilizing should occur in late winter or early spring for blooms. After flowering, pruning may be needed to prepare for more flowers. To avoid blight on petals, a spray may be needed before blooming. Evergreen shrubs are often used to create privacy fences or edging. Taller species may be used to line fences or surround a patio deck. The shrubs may also be used to line the back of planted garden beds. Those with larger lawns may prefer to create a path with the shrubs. Large colorful blooms can make a spectacular display along paths. It may also encourage birds and butterflies to visit the plants. Allowing bushes to grow tall can also increase their decorative value. A bare spot in the shade of a tree can be ideal for planting shrubs. Smaller plants may be added to create a colorful display year round. Container gardening is also popular for this type of flowering plant. A large pot can be used to house a single plant for decoration. These are often placed near front porches or on the patio or deck. Azaleas are often a symbol for fragile or ephemeral passion and love. This is often due to the delicate nature of the petals of the flowers. This interpretation often changes but passion remains to be popular. Some may use them as a sign of abundance in either life or love. This may also be used to represent womanhood, such as motherhood. These are popular around mother's day and other spring holidays. Some may use azaleas to express temperance in a situation or love. Pink often indicates love, while white shows purity and innocence. The azalea is often available for bouquets in spring or summer.